SSD Harriet is well on her way to developing a new career. 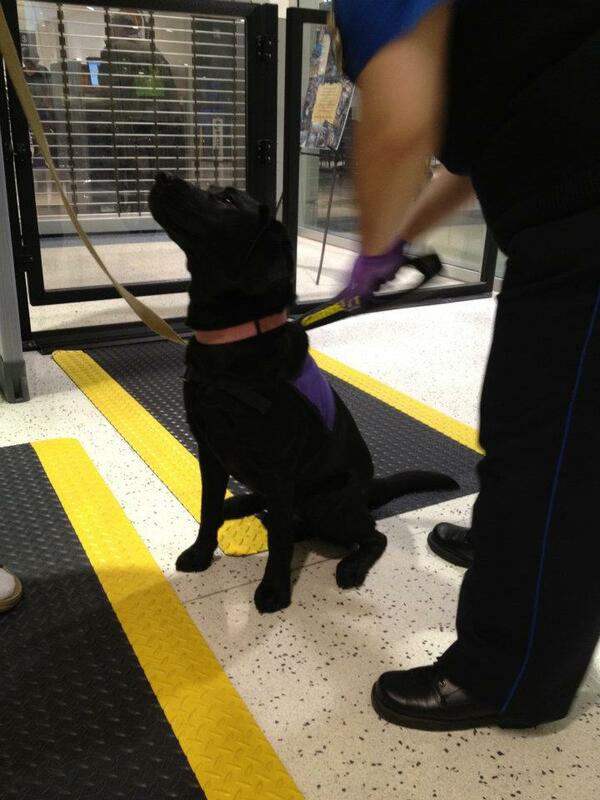 She’s learning how to be a bomb detection dog for the CIA. To become a service dog, a dog must have a certain temperament, and we always think about what would be best for the dog and the dog’s potential partner. We want to make sure that service dog work is a good fit for the dog. Although Harriet may not have been well-suited to service dog work, that doesn’t mean she’s not suited for another career. She loves to train and work, so we’re very happy that she’s starting a new career with the CIA. Her puppy raisers took her to Virginia to start her new training. 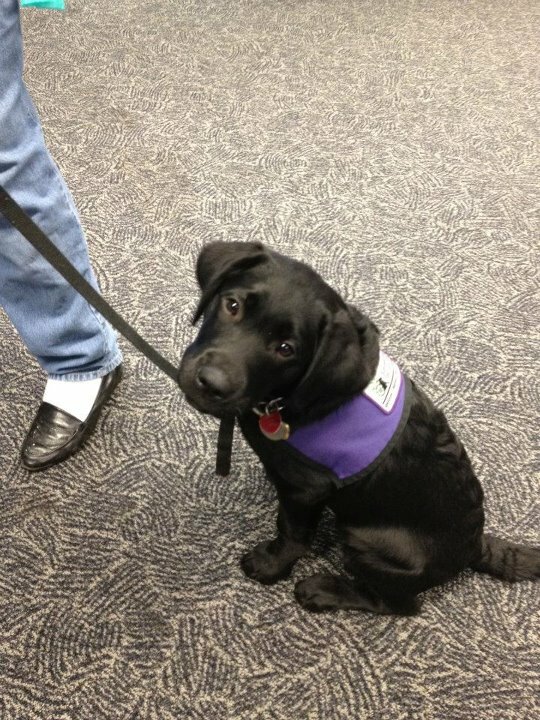 They met her trainer, who showed them around the building and explained how she will be trained. Her training is actually going to be very similar to her training through SSD. She will be trained with classical conditioning to imprint different smells. When she smells a certain scent, she gets treated for touching her nose to the correct spot. Harriet also met her new work partner. She spent some time playing with him, and then Peter, Harriet’s puppy raiser, had her demonstrate some of the things she learned during her SSD training. She is going to live with a family, including four children and two dogs. 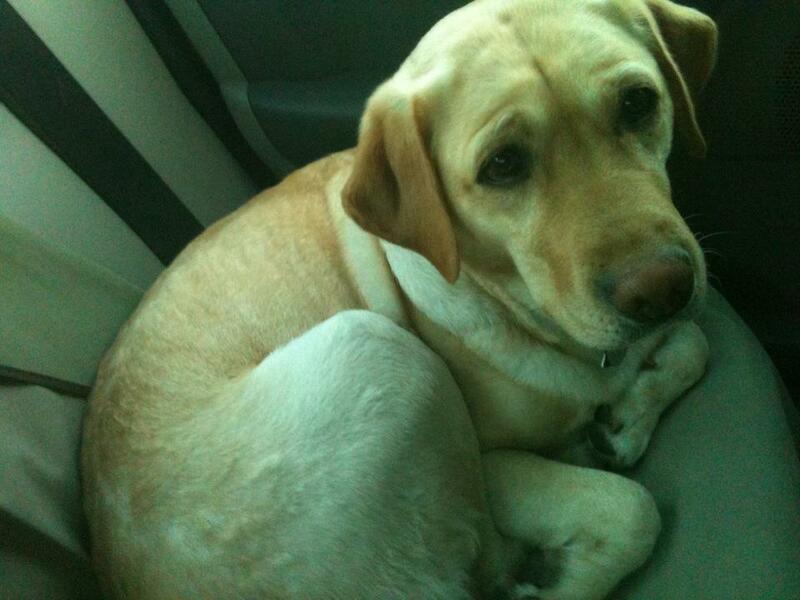 When she’s on the job, she’ll accompany her partner in a car that’s specially outfitted for dogs. It has a special seat for Harriet, as well as automatic fans, air conditioning, and an alarm to alert when the car gets too hot for her. She may even learn how to ride in a helicopter and spend some time overseas with her partner. Harriet is a very smart pup, and her puppy raisers worked very hard with her to build her skills. We have no doubt that she’ll take to her new training and become a great partner and bomb detection dog. SSD Seifert is the only puppy in his litter. That's doesn't mean he's lonely, though! He has his mom, SSD Opal, and his puppy raiser's dog Colby to keep him company. We've also been making sure that he gets to meet lots of other dogs. Socialization is very important for young puppies, especially young puppies in training to become service dogs. For Seifert, it's even more important, since he doesn't have any brothers or sisters to teach him how to interact with other dogs. Seifert has had several play dates with other dogs that are either relatively close to his age or relatively close to his size. Yesterday, he met SSD Fraggle and two of our trainer's dogs, Sonya and Rizzo. Check out the video of the dogs running in the yard! Seifert also knows how to entertain himself. While he was waiting for his new friends to arrive, he had a great time playing with a bucket! We’re hoping there are more puppies in our future! SSD Midge traveled up to Guide Dog Foundation for the Blind to be bred to a tall, dark and handsome lab named Elton. Elton is about two years old and has a wonderful temperament. If Midge is pregnant, we’re hoping for tall, lovely puppies. In addition to breeding Midge with Elton, we had the opportunity to evaluate several of the Guide Dog Foundation’s studs, and we took photos and videos so we can make breeding decisions about future litters. One of the Guide Dog Foundation’s studs sired the Eastern Star Litter, and we gave puppy Hope to them for their program. Usually, when we use a stud from another organization and there are five or more puppies in the litter, we send one puppy back to the organization that supplied the stud. 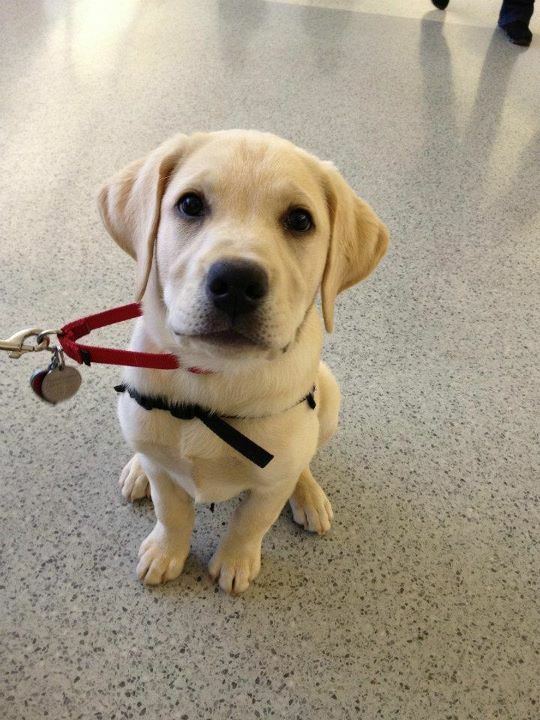 When we visited the Guide Dog Foundation, we got to see Hope! Unfortunately, although Hope was doing very well in her training, she developed some health issues and had to be discharged. If Midge’s litter with Elton is big enough, one of the puppies will be heading to its father’s organization. Thank you to the Guide Dog Foundation for giving us the opportunity to see Hope! Will there be more puppies in our future? We’ll have to wait and see! SSD Judge fell asleep less than three feet away from his favorite foods. That’s pretty impressive all by itself, but what’s even more amazing is that he could have easily grabbed that carrot cake or corned beef. He chose not to. Judge’s “leave it” skills didn’t appear overnight. His puppy raiser, Donna, has been working with him from the start. She began by working on down-stays. When Judge was a young puppy, she and her husband used baby gates to keep him in certain areas, but then they progressed to using the down-stay to keep him from crossing the doorway. They also trained him to “go to bed,” meaning he will go to a designated blanket and lay down. They used both of these skills to keep him in certain rooms. Once Judge had mastered the skill of not crossing the threshold without his puppy raisers’ permission, they decided to challenge him even more by adding a “leave it.” She asked Judge to “down” and “stay” in the doorway of one room and then placed food on a plate in the other room. The food was within his reach, if he had chosen to get up. Donna then walked away and disappeared from his line of sight, although she could still see him. Then she walked back to him, clicked and treated him, as long as he didn’t break his down-stay. Gradually, she increased the amount of time before she returned until Judge could hold his down-stay and leave it for over 30 minutes! He was even able to relax enough to fall asleep. When Judge ignores the plates or listens to the cue “leave it,” Donna picks up the plate and treats him with one of his favorite food items. For example, if he leaves a plate of his favorite salad greens, Donna will pick up the plate and give him a piece of salad greens by hand. That way, Judge learns that the good things in life come from his handler, not from the floor. One time, Donna forgot to pick up the plates outside, and Judge started making a beeline for them. She quickly said “leave it!” and to her amazement, he did! He stopped as soon as he heard the cue. Judge’s next challenge is to learn to generalize the cue “leave it,” so he can do it anywhere, not just at home. Soon he’ll have no problem walking through a busy cafeteria and ignoring any food on the floor. Maybe you’re planning a summer vacation, or maybe you’re planning to visit distant family over the holidays. Or maybe you have to take a business trip. 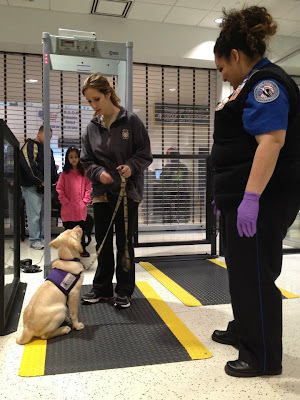 No matter what your plans, if you’re planning to travel by air and you have a service dog, chances are that you’re also planning on taking your service dog with you. Although we try to take our puppies to the airport at least once, this may still be the dog’s first time on an actual flight. It may also be your first time flying with your service dog. 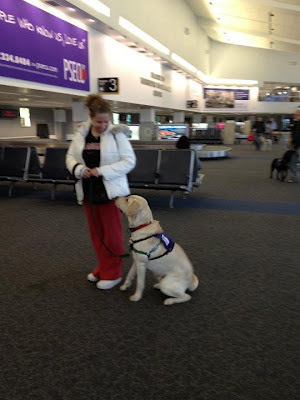 Here are some tips and other information for flying with your service dog. Even if you and your service dog are veteran fliers, we hope you’ll find these tips useful. We suggest packing some extra food in your carry-on, just in case you get separated from your checked luggage. Also be sure to pack a bowl that can double as a water bowl and food dish. Some people pack one or two of their dog’s favorite toys, which can be helpful if it’s a long flight. We recommend quiet toys. Save the squeaky toys for when you reach your final destination. Although many people book their flights online, it is often helpful to call the airport and let them know you have a service dog. By law, you cannot be charged an additional fee for your service dog, and they can travel in the passenger cabin with you. By calling, you can also ask if the airport has any potty areas. Many airports are adding them, but not all personnel know where they are located, and those potty areas could mean the difference between a comfortable and an uncomfortable flight. You never know how long you and your dog will need to be at the airport. Never feed your dog before your flight. You may also want to restrict their water. The following airport security tips come from the Transportation Security Administration website. Make sure your dog is wearing his service dog harness, and if you have any additional identification for him, carry it with you. 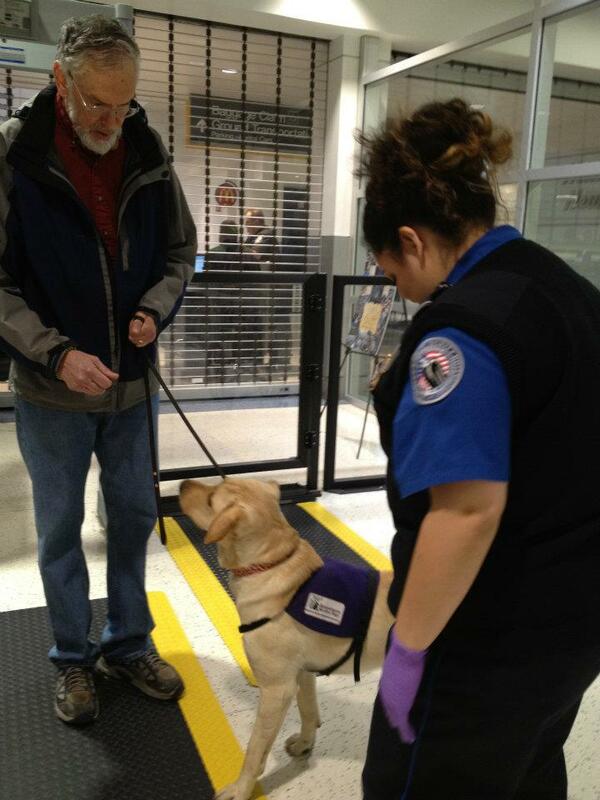 When you get to security, let the Transportation Security Officer know that you have a service dog. You should be given the opportunity to move to the front of the line. At any point of the security checkpoint, you may not be separated from your service dog, and your service dog does not need to remove his belongings, such as his harness or other equipment. 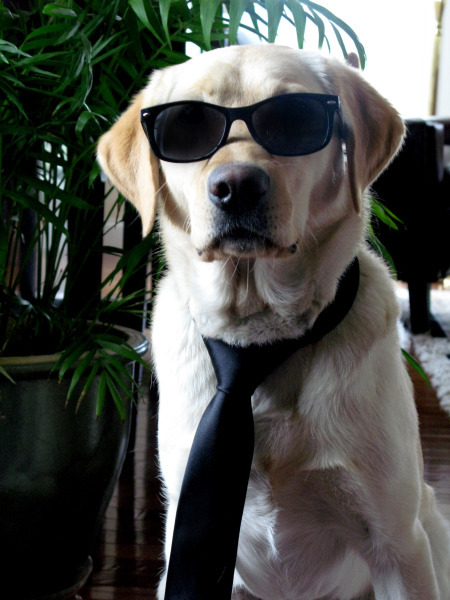 Make sure you set your dog up for success. Plan how you’re going to go through the metal detector. If your dog will be most successful going through with you, let the TSO know that that’s how you and your service dog will be going through. You can also have your dog to through first and you follow, or you can go through first and have your dog follow. The TSO should ask your permission before touching your dog. 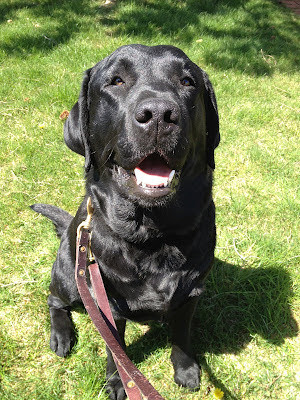 When the TSO is conducting a search of your dog, you are in charge of controlling your service dog. Keep him calm and focused so the TSO can do his or her job. 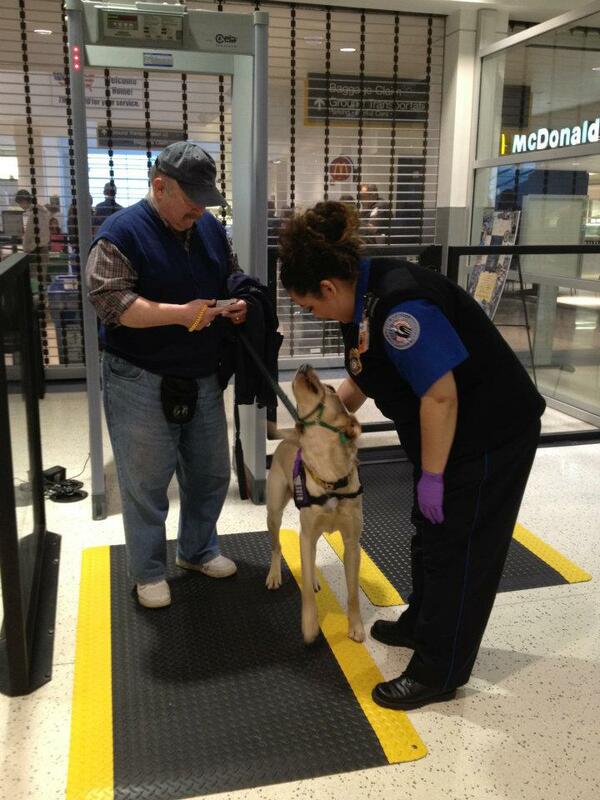 Please remember that if you need to take your dog outside to potty, you will need to pass through security again. 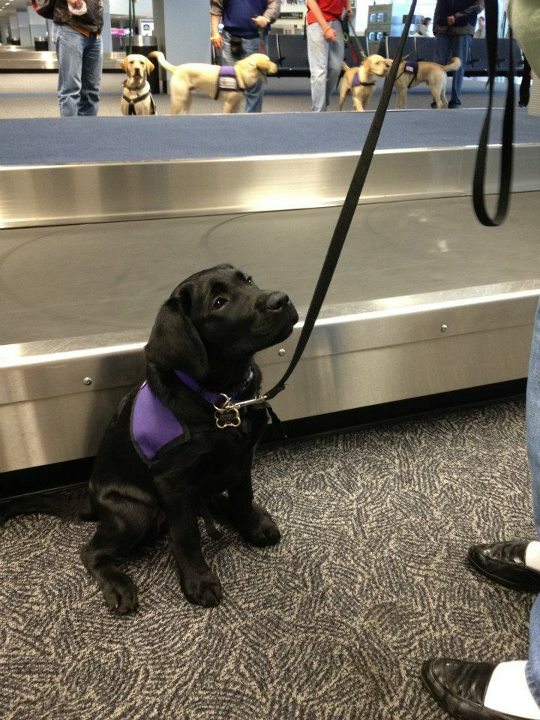 You and your service dog may be able to board your flight early. Make sure you get to your gate early, and let the gate agent know that you need to board early. Then make sure that you don’t go too far away so you are easily ready when it’s time for you to board. Your service dog will be able to ride with you in the passenger cabin, but you must make sure that he is tucked away safely. It is extremely important that he not block the aisle. When you have your dog settled, it’s up to you to decide how you want to deal with people’s attention to the dog. You may have a seatmate or other neighbors who ask to pet the dog. Here is where you’ll have to do whatever will make your dog most successful. Some people ask their neighbors to ignore their dog until the very end of the flight. Other handlers may let people pet the dog as long as they stay in a down-stay. If you’re catching a connecting flight, try to make sure that you have enough time to get to your gate, and perhaps even take your dog for a potty break. 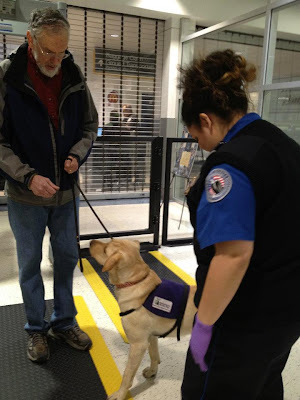 This is certainly not a comprehensive list of everything you need to know about flying with your service dog, but we hope you’ve found it helpful. If you have any other tips, please leave them in the comments. Happy flying and safe travels! 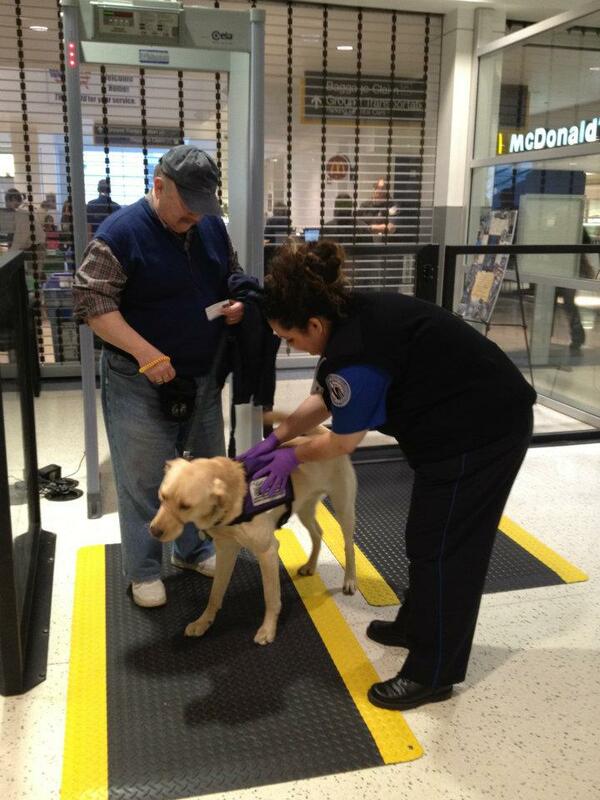 At some point in their lives, service dogs may find themselves in an airplane 30,000 feet above the ground. 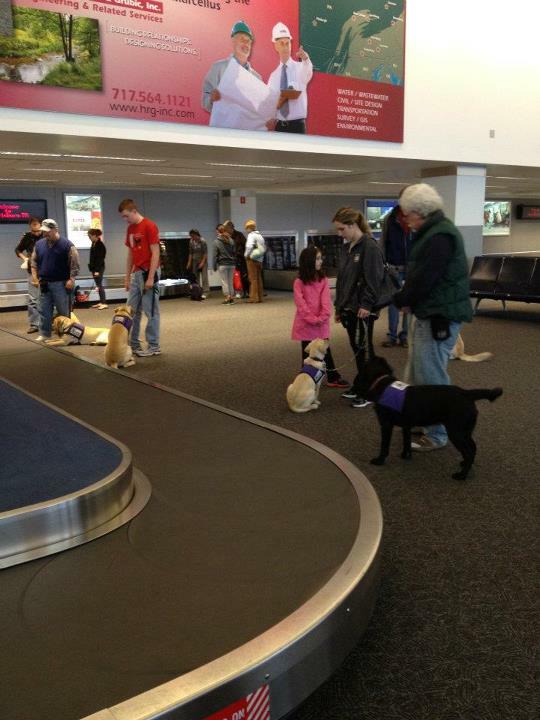 To help prepare them for this experience, we take our dogs to the airport while their still in training. On Saturday, our puppies in training went to the Harrisburg International Airport. Everyone met in the parking garage, and we gave the dogs the chance to potty. 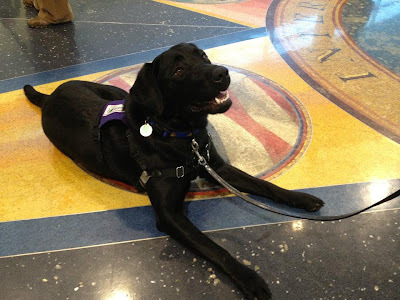 While service dogs must always be given the opportunity to potty before entering a building, it’s especially important when entering an airport because they may not have another opportunity for several hours. To enter the airport, there are both regular doors and rotating doors. We took the dogs through the rotating doors to give them the chance to experience it. If you practice this with your dog, be extremely careful that you and your dog are both safely in the door space before you start turning the door. Once we were all inside, we headed to security. HIA was wonderful! 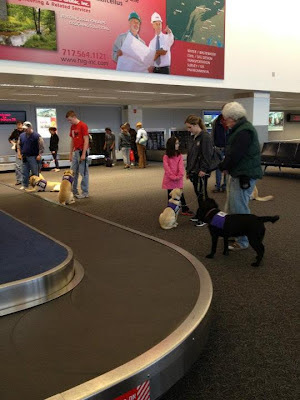 They opened up a private line for us so that all of our dogs could gain experience without interfering with people trying to get through security to board their flights. 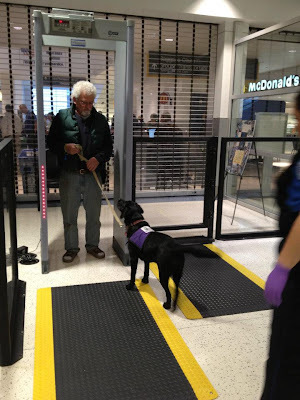 Our dogs were able to go through security twice. 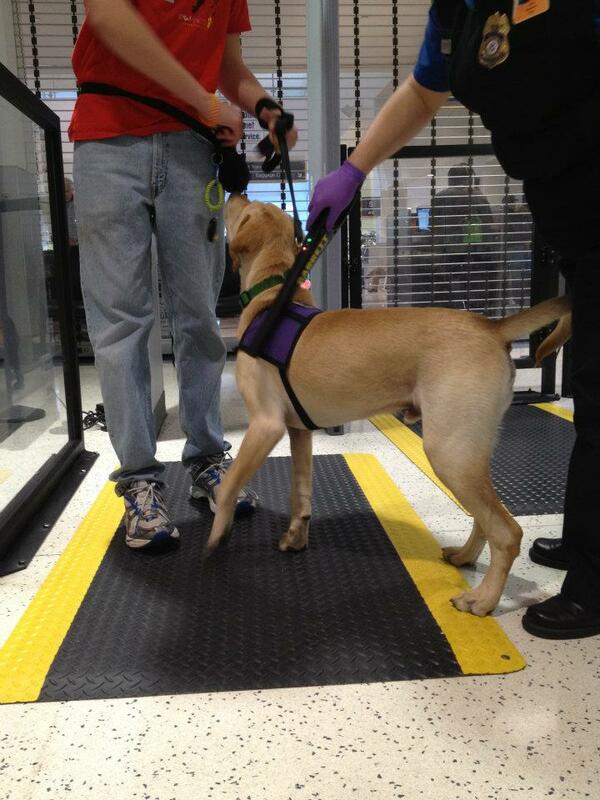 The first time, our dogs and puppy raisers went through the metal detector and the dogs were patted down. The second time, the TSO used the wands to scan the dogs. Our puppy raisers did a great job keeping the dogs calm and focused so the TSOs could do their job! All of our dogs did great! Thank you to the Transportation Security Administration at HIA for being so accommodating! After all of our dogs had the chance to go through security twice, we went down to baggage claim to practice walking on a loose leash and to get the dogs used to being in that area. The baggage claim belts can be very strange to a dog, and they beep before they start moving. The one thing we didn’t do was go through security with luggage. 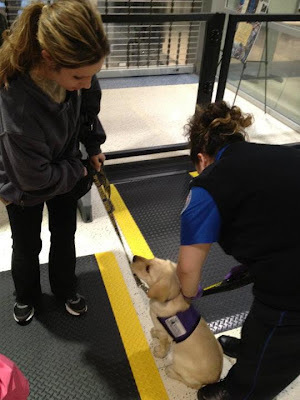 Service dogs need to have an excellent down-stay for that because they need to be in a down-stay while you take off your shoes, put your luggage and personal items on the belt. Then they need to be in a down-stay while you gather all your items back together. Tomorrow we’ll share a post about what you can expect when you actually fly with your service dog.